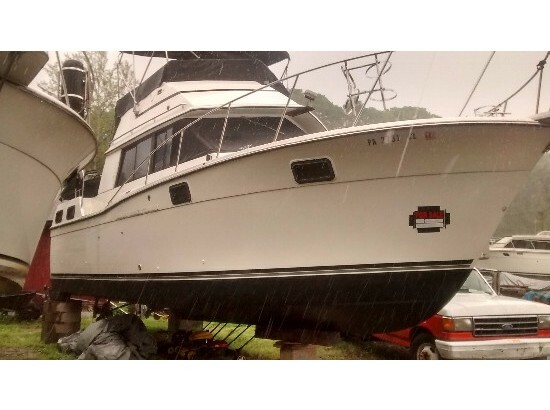 1986 Carver 3207 AFT,Carver 1986 3207 AFT cabin. Twin 350 inboards with approximately 550 hrs and is a great runner. Newly installed Westerbeke 5kW generator with 200 hours on it and 12,000 BTU heat and air which was newly installed also and has very low hours. We have owned this boat for 14 years and has been a great boat and was always in fresh water. Full galley with microwave, electric stove and oven 10 cubic ft refrigerator. 2 bathrooms with stand up shower in forward head. Sleeps 6 comfortably. Asking $22,500.00 obo.